← Mussel Festival Growing Exponentially in St. Lunaire-Griquet! A couple of weeks ago, I had the pleasure of visiting with Norman Young at his carving shop in St. Lunaire-Griquet. The shelves boasts a variety of carvings that were handcrafted by Norman from a variety of stones, bone and antler, just as the outside sign states. A beautiful sword, masks, inukshuks, animals and Northern figures capture your attention upon entry. We talked about small business, trade shows and opportunities for partnerships, as his products truly deserve a broader audience. If you are en route to L’Anse aux Meadows World UNESCO site, as tens of thousands of people do, I recommend you drop by Stagehead. 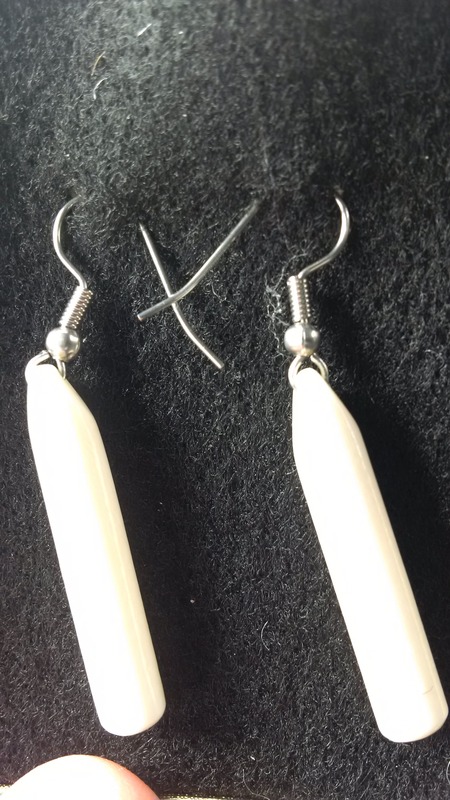 I purchased a lovely set of whale bone earrings for $30. They will make a lovely present. Before I left, Norm showed me how baby powder was made, as he filed a soapstone to create a talc dust. We have incredibly talented carvers, weavers, knitters, potters, artisans and artists of all kinds throughout the tip of the Great Northern Peninsula. Start exploring today! Posted on August 25, 2014, in Art, Business and tagged antler, art, bone, Caribou, carving, L'Anse aux Meadows, Moose, Newfoundland, soapstone, St. Lunaire-Griquet, stagehead, Vikings, Whale. Bookmark the permalink. 1 Comment.